The above is one of the frequently asked questions I get via email. I receive this email so many times that I decided to dedicate today’s article to answer this question. So if you’ve been wondering what oil to use in your meals that will stop the rate at which your body put on fat at record speed, then I want you to pay attention and read this article to the end. Here’s a Truth: Most of our Nigerian soups, stews, food are prepared with a lot of Palmoil. All these soups and many more… are prepared with lots of Palmoil. Palm Oil contains lots of calories and does not encourage fat loss. 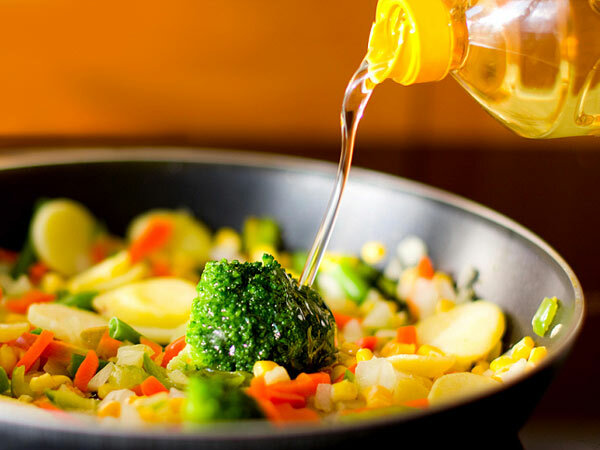 So What Is The Healthiest Oil To Cook With? The healthiest Oil to cook with is: Coconut Oil. Coconut Oil has powerful health benefit. Improves good cholesterol in the body and contains over 92% saturated fat (which is good) that slightly boost metabolism and make you feel full. The next best Oil to cook with is Pure Virgin Olive Oil. These two edible oil are available in Shoprite stores and any other major supermarket in your town/city. When next you go to a supermarket; ask for edible pure virgin Olive Oil. The one used in Nigerian churches are probably not as pure or edible. The above two oils are healthier than Vegetable Oil, Canola Oil, Sun Flower Oil etc. But let’s be realistic, there is only so much you can cook with Coconut Oil & Olive Oil when it comes to Nigerian foods. Let’s say you want to cook Ugwu or Vegetable Spinach Soup, you most likely would not want to cook it with Olive Oil or Coconut Oil. Trick # 1 – Use 80% less Oil. Use 1-2 spoons of palm oil rather than using 5-10 spoons like others do. Trick # 2 – Increase the Bell Pepper (Tatase) in your vegetables to give it more redness. Trick #3 – Use the stock from the cooked meat/chicken to cook your stew. STEP 1 – Season & Boil your chicken/beef as desired until tender. STEP 3 – Blend your tomatoes & Pepper & put it in the pot. Heat until the water is dry. STEP 4 – Pour in the chicken/free stock and cook for 15 minutes. STEP 5 – Add the chicken/beef and leave to simmer for 10 – 15 minutes. If you notice, there is absolutely no where in the above recipe that we have used alm Oil or any type of Oil in the stew above. This is how you should cook your stew if you are trying to lose weight. Nowhere in the above recipe did we use any palm oil. Cook this way and you would have cut up to 1,300 calories out of your pot of stew. And just in case you can’t imagine your stew without palmoil, let me tell you; This soup taste great without palmoil. You just need to suspend your unbelief and try it out first before passing judgement. If you follow the above tips, you’ll see result in your body if you combine it with exercises too. And if you are looking to burn fat off your body and get rid of belly fat; make sure you get a copy of my program titled: The 30 Day Fat Loss Program Here. I wish you Good Luck With your Weight Loss Goals.